The first European expedition to the Singleton area was recorded in 1820. John Howe’s party came across the area on St. Patrick’s Day and accordingly named it St. Patrick’s plains. Before European settlement, the original inhabitants of the area were the Wonnarua people, however little is known about them. Singleton was named for Benjamin Singleton, one of the members of John Howe’s party. Similarly Mt. Thorley was named after Phillip Thorley. Both were granted land for their participation in exploring the area. Henry Dangar was granted land in the area for his work as a surveyor. Singleton was officially founded as a town in 1835, and became settlement for farming tobacco, wheat and livestock. It also became known for horse-breeding and dairy farming. The first winery in the area was started in 1831, between Singleton and Branxton, called Kirkton (present-day Lindeman’s). The first mayor of Singleton, Alexander Munro, had award winning vineyards from 1860. In 1863, Singleton became connected by railroad, allowing for goods and people to be transported more easily, and further developing the economy. 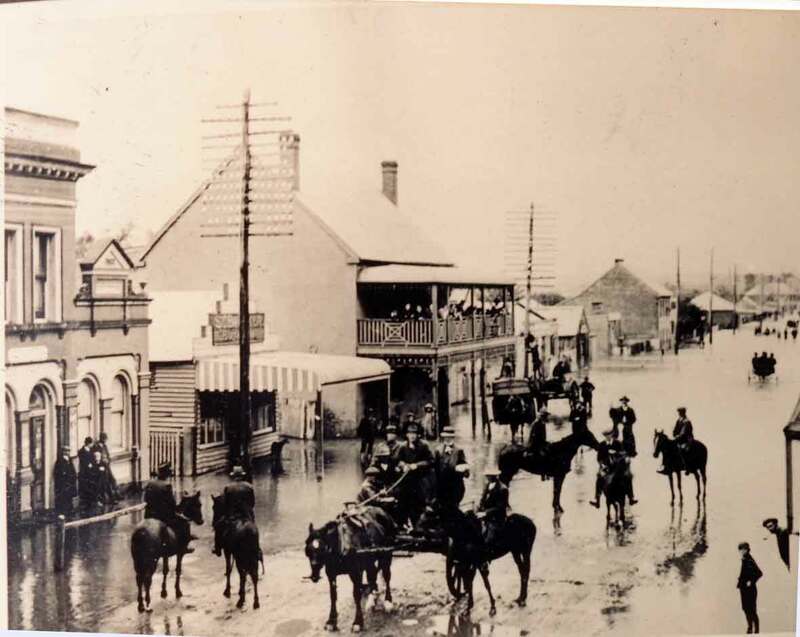 Singleton's 1913 Flood, Courtesy of the Singleton Historical Society. The coal industry in Singleton can be traced back to the 1850’s in Rix’s creek and Glendon. During this time period, the coal was sold to be used for fires in homes and inns, and the first people to mine coal were innkeepers. At Rix’s Creek, a substantial mine was developed by James Singleton (brother of Benjamin Singleton). and by the late 1800’s there were about sixteen different mines in the Singleton area. Coal development slowed after the Rix’s Creek mine was closed in 1917. Sporadic mining continued in the area through the years, but was not completely viable until electricity increased the need for coal. After WWII, electricity started to become a standard commodity for Australians. This development led to the revitalization of the coal industry in the Singleton area. Today, Singleton still remains a town whose growth and economy is encouraged by the mines in the area. In 1947 the population of Singleton was 2,996. By 1976, the population reached 12,359. Rapid growth and expansion continued and since then Singleton’s population has doubled. Whitelaw, Ella. A History of Singleton. N.d. Singleton Historical Society and Museum. Singleton Mining History. NSW Minerals Council.